My blue green scrap mini patchwork has been laying in front of me more than one month. I want to make in different colors so collect all the rests in red. They were not so much and I have to cut from entire fabrics. 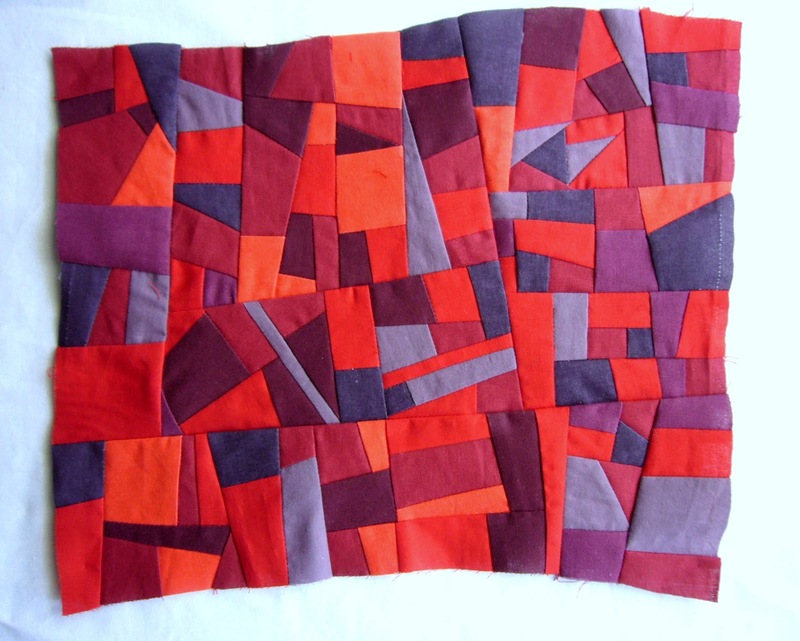 The piece was going to be "too hot " with all these red scraps, so I have added some violet. I leaved the wavy edges as they are. Compare to blue green piece this one has smaller parts. Like both of them , but honestly said I have sewn the first one much more easy and fast. It was like a game. Collecting pieces was a fast solved puzzle. Do you wander what I shall do with them? Might be make in other colors and collect them in a bigger wall hanging or make separate framed works. The last one I have framed turned out great. I know, I know so long without posting here. Too much ideas, too much to do. Finally I did and succeed to write a post . At the beginning it was an idea to participate in the quilt contest in Main, Germany. The theme was Light and Shadows. 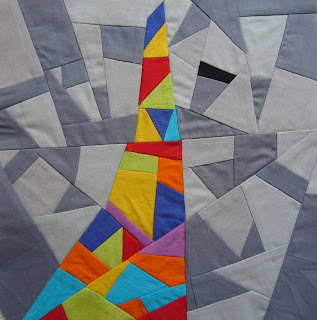 I like it and have some ideas, but I am not absolutely sure I could make a competitive quilt. I have made different quilts, but still I am a low spirit quilter. Anyway I decide to make a mini art quilt and stretch on a frame. 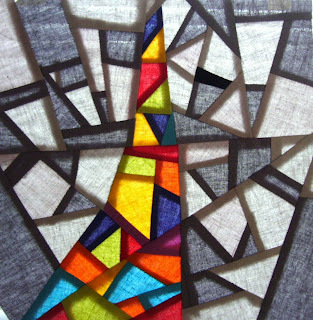 The pieced work in front of the window. > a batting and back fabric. It is better to use fusible batting. > And a frame with a loop of course. Note that the backing and batting have to be smaller than the top itself to prevent bulk. In traditional quilting backing and batting are bigger. Lay the top right side down, then fused batting with backing. Look at the picture how are trimmed the corners. The exceed fused batting has to lay on the sides of the frame. Displace the frame and basting . I used thread, but you could spray if prefer. Using zig-zag zsitch atatch a felt strip at each side. At this step you would have such result. Now it is time to add the frame. Lay the quilted top face down and place the frame on it. Fold the upper side and tack. Fold the corners as you wrap a parcel with paper and tack the next two opposite sides. Screw the loop and stitch a label. So don't make my mistake. I suppose you are wandering about size. Here it is - 6 inches square- what a mini quilt. 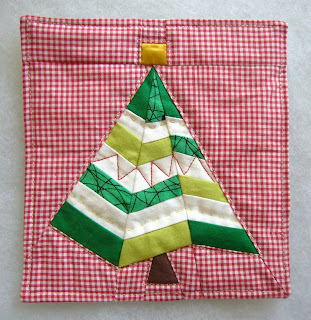 I am still wandering about necessity of quilting for such small pieces. Some months ago I have reopened my ETSY shop for handmade creations - designed and made by me. 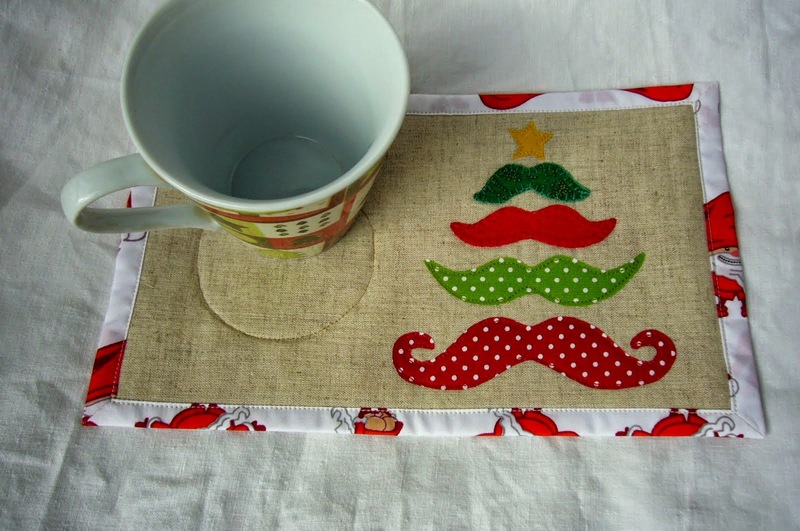 Quilts, coasters, mug rugs and more.Wait for fiber art wall hangings and framed art quilts. From 11 till 21 of July I have a special offer in my Etsy shop. I always wander what does it mean Christmas in July. It is too early to begin the preparation for the Christmas in December. Type on Google search bar and what I have learned. It is so funny. 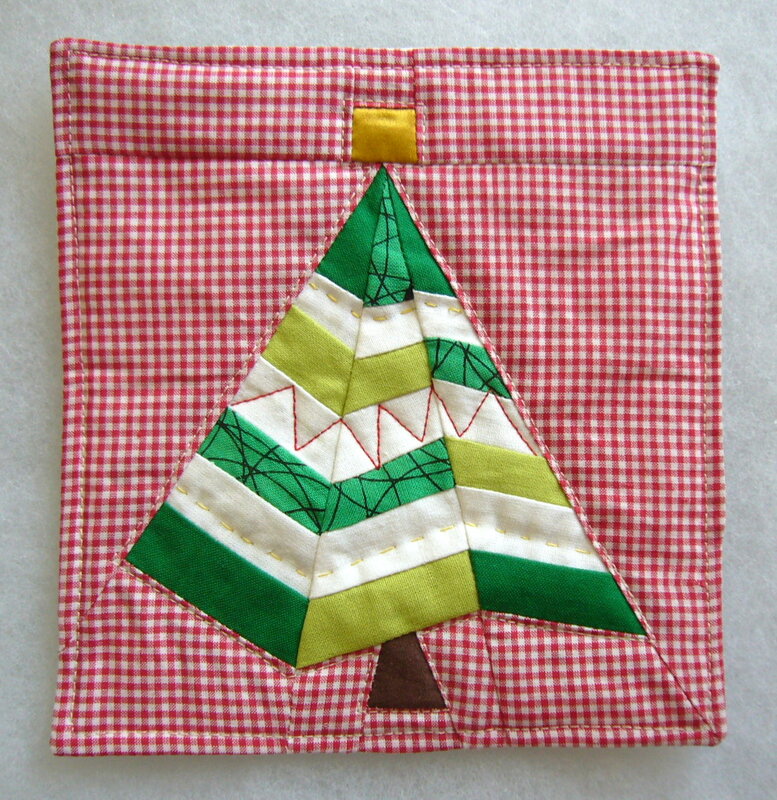 I have designed a paper pieced tree for Christmas in July. You could make many ways with different combination of green printed fabrics, add white lines as snow, add golden fabric as garlands. You could embroider a star on the top or hand stitch the garlands. 6 inch square fusible batting. First fuse the batting on the wrong side of the backing. Note that you have to iron at the right site. Lay them right side together and sew round perimeter leaving 2-3 inches opening for turning over. Clip the corners to prevent bulk. Now comes a little trick. Fold and iron well the seam allowances at the opening - the top and the backing. This will be very helpful after turning over. Look how it loos at the side. Now turn and iron well. Stitch round perimeter. Add embellishment and quilting as you desire.